Sagging, tired and ageing eyes are something many people have to deal with, but knowing you’re in good company doesn’t necessarily make you feel any better about it. We live in a youth-obsessed society and as a result seeing signs of ageing in your skin, including eye bags and wrinkles, can make you feel dissatisfied with your appearance. When dealing with the issue of ageing eyes, there are a number of options open to you – but which one is best? The first is to use a makeup with good coverage, specifically a concealer. The power of makeup should never be underestimated because, with the right highlighting and contouring, almost any issue you have with your facial features can be improved. This is no different when it comes to the signs of ageing around the eyes – and nowadays there is a myriad of products available that cover your imperfections whilst improving the quality of your skin and protecting it from further damage at the same time. Puffiness and dark circles can be instantly and dramatically improved with carefully applied concealer. This is also a great option for those working on a tight budget, as it allows you to create an instant illusion of younger, brighter eyes – without the price tag. Cosmetic roll-on eye products have become very popular in recent years, as they can reduce the look of puffy eyes and eye bags almost immediately. Cosmetic roll-on treatments come in a wide range of prices, benefits and effectiveness. Olay provides a particularly popular and cost-effective eye-roller, which has garnered great reviews. Roll-on solutions are great for people who may suffer from aching eyes, because a lot of roll-on products offer soothing properties, too. If cosmetic products just aren’t giving you the results you are hoping for, or you simply want to be rid of your eye bags and wrinkles for good, then blepharoplasty cosmetic surgery might be the right option for you. 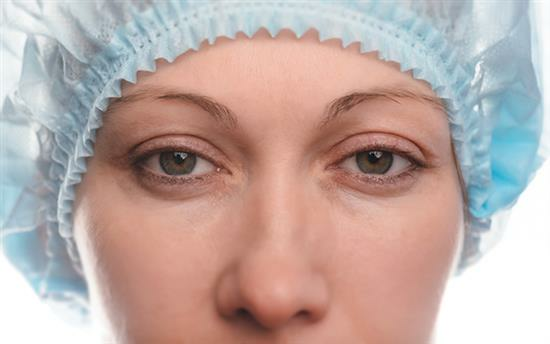 Blepharoplasty comes in two forms: upper and lower. Upper blepharoplasty focuses on the upper eyelids and focuses on the excess skin of the upper eyelid. However, it does not improve the lines at the outer corners of the eyes, such as crows’ feet. Botox is the best solution for crow’s feet. Lower blepharoplasty focuses on the lower lids and eye bags. Blepharoplasty is a great option for patients looking to reduce puffiness around the eyes and sagging skin around the eyes. “Blepharoplasty surgery is a great surgical option to rid you of ageing skin around your eyes. A major benefit to blepharoplasty surgery – when compared to temporary measures like makeup – is that it is a more long-term solution to your eye issues. Which option is the best is a difficult question to answer. Many factors must be considered in order to make this decision. The decision may vary from case to case, depending on financial budget, compatibility with treatments and lifestyle choice. Which option is best is therefore subjective and only you can decide which is right for you. If you would like more information on blepharoplasty surgery then booking a consultation is strongly advised with a cosmetic professional with extensive knowledge and experience performing this procedure such as Mr Jag Chana.